Painting Pumpkins aka my kids’ favorite Halloween activity. We have a new Halloween activity champion in my house! And that is not a title that people can come by easily – considering we have A LOT of Halloween activities going on over here… but this one is reigning supreme right now. Hello painting pumpkins. 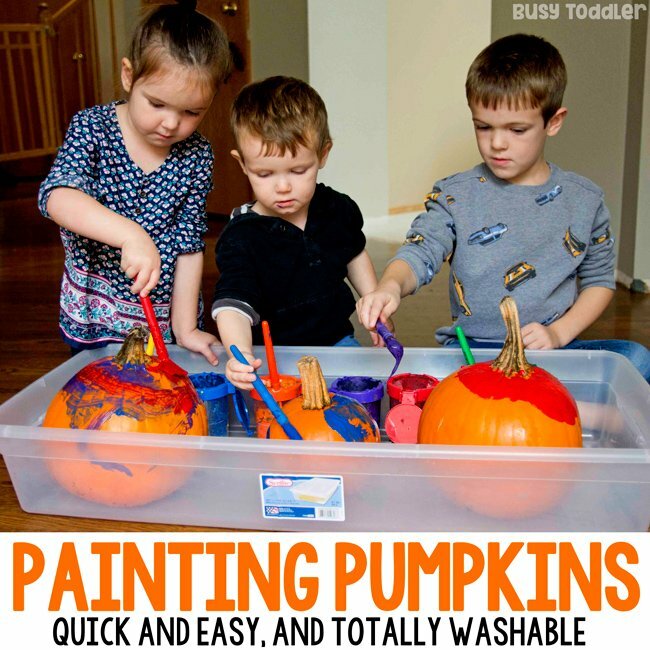 Best part about painting pumpkins with washable paint? You can clean them off and keep using them for other activities…. 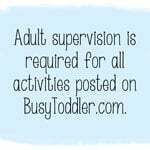 RELATED: Looking for more Halloween activities: Check out my post 40+ Halloween Activities for Toddlers. I know that Painting Pumpkins is NOT some revolutionary idea. In fact, it’s a pretty “run of the mill” “tale as old as time” type activity. You can find ways to do it with tape resist. 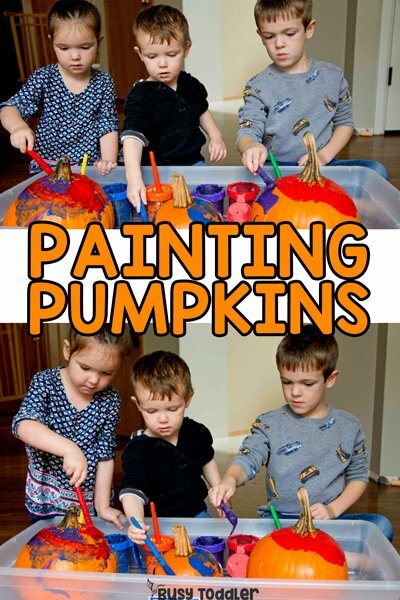 Or try doing a drip painting pumpkin. Or even with squeeze paint. 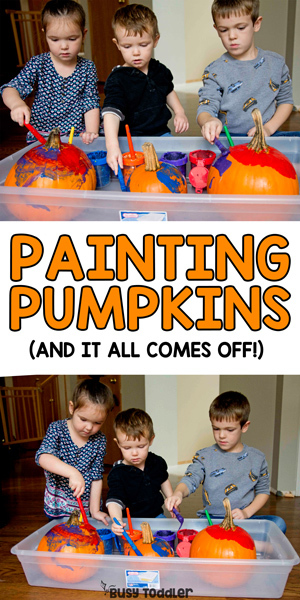 But this is how I made Painting Pumpkins into an easy kids activity. 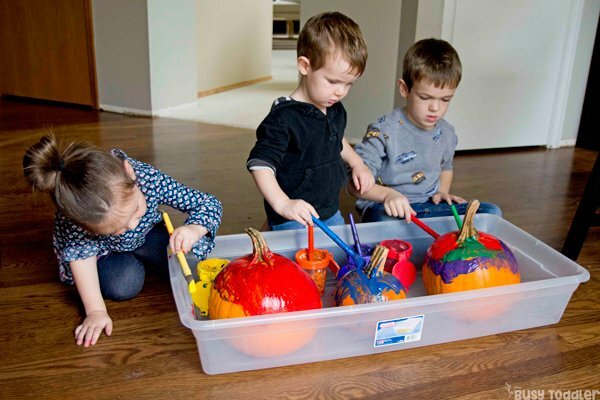 This is how I used painting pumpkins to make it to nap time one day. My kids loved this. I hope yours do too. 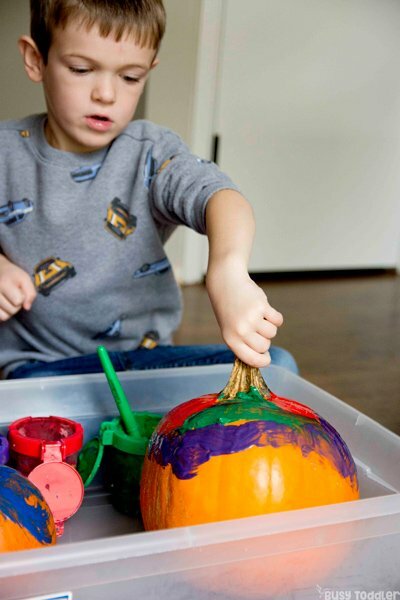 My son (5) rotating his pumpkin to paint the other side. 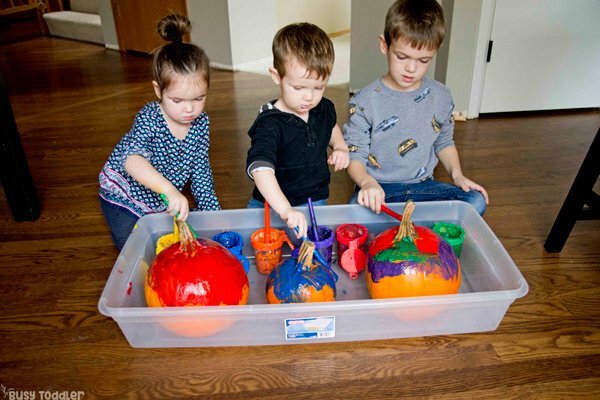 I set the pumpkins in the storage container with the paint cups. I ALWAYS do messy paint activities in this storage container because it keeps everything together, in one spot, and from rolling away. It makes for one super easy clean up. I didn’t have a bevy of directions for this activity. 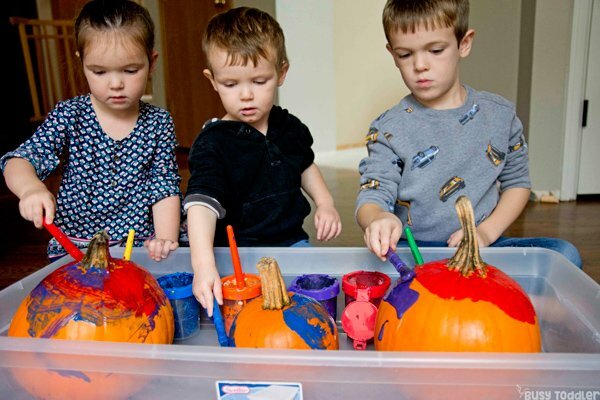 It was a process art activity – so there’s no set expectation for how the pumpkins would look at the end. Now, in hindsight, it really didn’t matter if they painted the stems or not because they wiped clean fine, but I didn’t know that heading into this. Since these are my “decorative” pumpkins for our front doorstep, I did plan to clean them off at the end. But in any event – I wanted this to be an awesome process art activity for my kids…and boy was it ever! This was such a great multi-age activity! 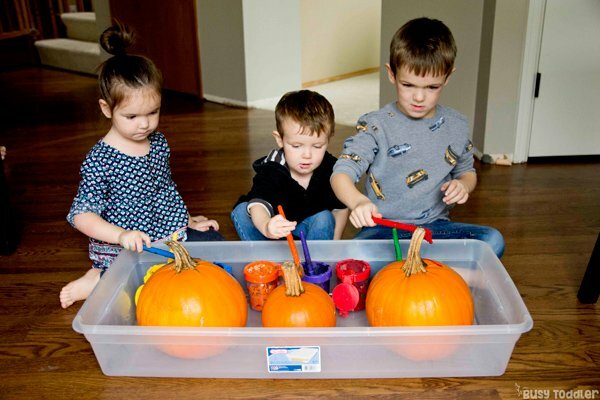 My kids are 5, 3.5, and newly 2 – this activity worked for ALL THREE OF THEM. That doesn’t happen a lot around here! 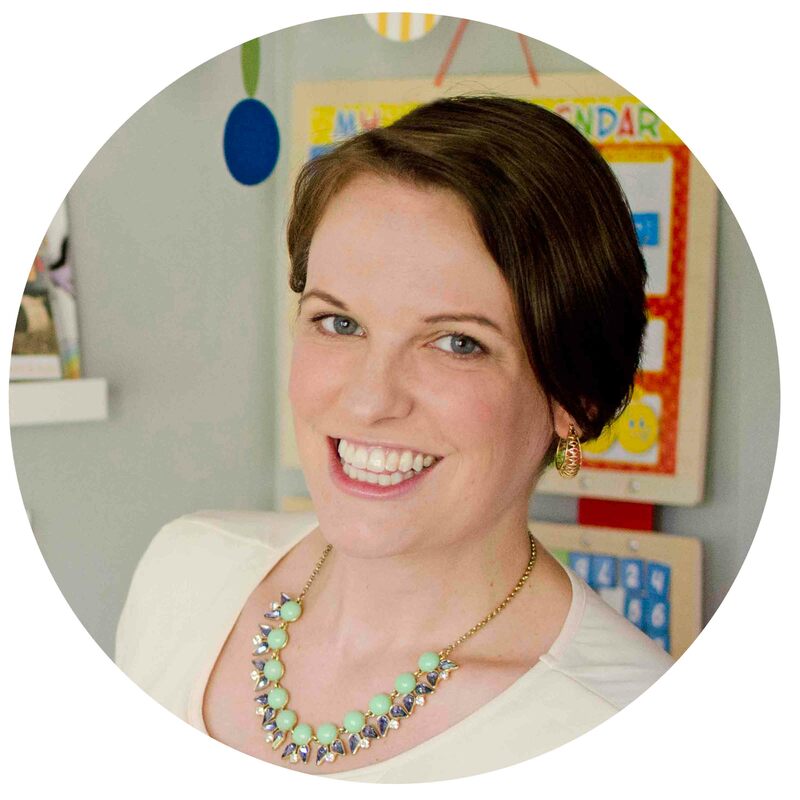 A one-size-fits all activity is like the holy grail of my activity’s life. 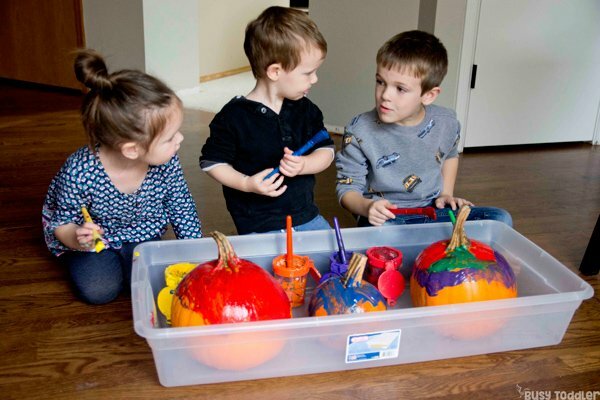 By the end of this, it was 40 something minutes of painting and each kid had carefully painted three different pumpkins. Did they clean up well? Yup! And my kids were fine with the pumpkins getting cleaned off! They know that not all art is “forever art” and are very used to painting objects – like trucks and dinosaurs. Some of the pumpkins I sprayed with the hose and some of them just rinsed off gently over a few days in the rain. It was the perfect Halloween kids activity! 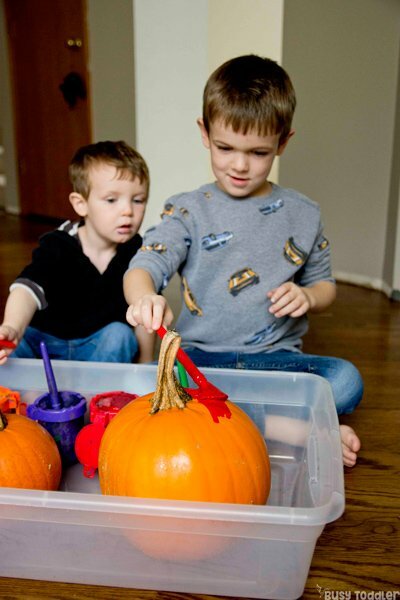 Halloween activities are so easy and so fun! 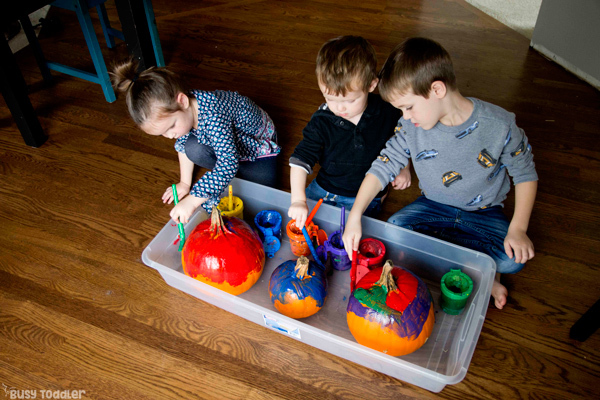 This painting pumpkins activity is definitely going to stay in our Halloween rotation and I’m already looking forward to it next year. 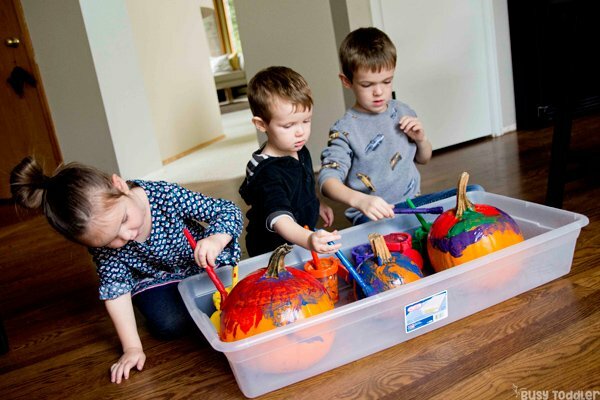 When will you try painting pumpkins with your kids?